If you need a new kitchen or bath or want to renovate your existing one, Shiver Lumber offers quality cabinets by Matrix and Echelon that are all plywood construction and are available in many styles, colors and finishes. We offer every type of counter top available from laminate to quartz to granite in many colors and patterns. 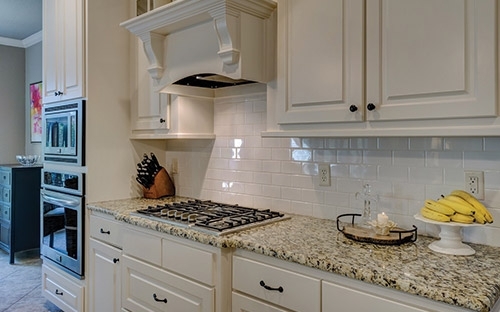 Granite- Granite counter tops are strong and highly heat-resistant. Crafted from strong, beautiful natural stone, its ultra-smooth surface is preferred by bakers. Quartz- Quartz counter tops require minimal maintenance and are incredibly strong. They can endure daily stressors without scratching or sustaining damage. Laminate- Laminate counter tops are durable, affordable and require little maintenance. Choose from an array of style and color options. SOLID SURFACE- Solid surface counter tops are seamless and easily resist water, bacteria and stains. One-piece construction offers a clean look and allows for integration of additional kitchen accessories. Click here to search by Door Species! Matrix offers Ready to Assembled (RTA) cabinets that are KCMA certified, all plywood construction. Forevermark Cabinetry features the use of waterborne UV finishes. Click here for more info on Matrix! Select from our broad door styles in five wood species. Offering a variety of raised center panel, flat center panel, slab, and shaker styles, our cabinets can bring your dream kitchen to life. All are available with professional installation. Top Kitchen & Bath Brands You Trust and We Carry!